Airway diameter reduction, caused by smooth muscle contraction, vascular congestion, bronchial wall edema and thick, tenacious secretion. image from: ©Edward C. Klatt MD, Department of Pathology, University of Utah, Salt Lake City, Utah, USA, and by designated contributors: used with permission. Cyanosis: -- very late sign; suggestive that extreme hypoxia may go undetected. There are three principal symptoms that characterize asthma. These are dyspnea, cough, and wheezing with wheezing being particularly prominent. 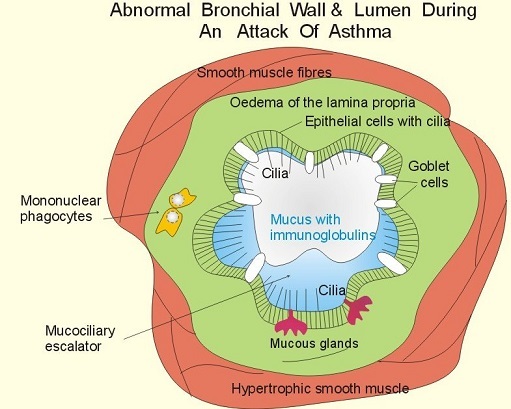 As we have noted earlier, asthma is an episodic disorder with the above symptoms commonly exhibited. Initially patients experienced chest constriction perhaps with a nonproductive cough. Audibly harsh, wheezing respiration is then noted; expiration is prolonged and difficult. Tachypnea, mild systolic hypertension and tachycardia are frequent presentations. Lung overinflation is typical in the anterioposterior thoracic dimension (diameter) increases. Severe or prolonged asthma attacks are associated with a loss of adventitial breath sounds along with notably high pitched wheezing. Respiratory accessory muscles become more prominent as well as paradoxical pulse-signs indicative of severe obstruction with impaired, significantly impaired pulmonary function. Paradoxical pulse requires significantly large negative intrathoracic pressures; therefore, with shallow breathing, condition which does not favor development of large negative intrathoracic pressures, significant obstruction can be present even in the absence of paradoxical pulse. [Paradoxical pulse definition: Inspiratory decrease in arterial pressure >10 mm Hg with Inspiratory venous pressure unchanged (Kussmaul's Sign); Paradoxical pulse signs: Palpable decrease in pulse with inspiration Inspiratory systolic blood pressure decreased over 10 mm Hg less than expiratory pressure]. Significant disease may remain if the endpoints are only an a reduction in wheezing and the resolution of subjective complaints. 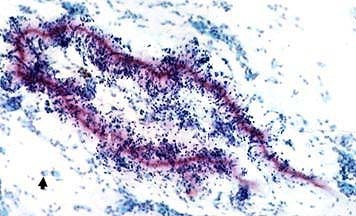 The conclusion of an asthmatic episode may be associated with coughs producing a thick, stringy me at this in the form of distal airway casts (Curschmann's spirals) which when microscopically evaluated shows the presence of eosinophils and Charcot-Leyden crystals. 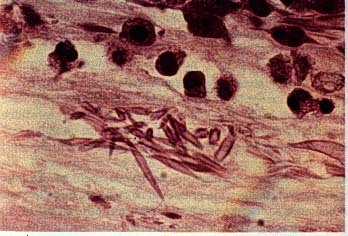 "CHARCOT LEYDEN CRYSTALS, MICRO - Eosinophilic needle-shaped crystalline structures. Represents breakdown products of eosinophils. Seen in asthma and eosinophilic pneumonia." Severe mucus plugging with possibly imminent suffocation may occur and in this case the cough would be ineffective and the patient will be gasping. Such circumstances may necessitate mechanical ventilation. Atelectasis (collapsed lung) may also occur in asthma. 2 Kelley, H. William, "Asthma" in Pharmacotherapy: A Pathophysiologic Approach, (Dipiro, J.T., Talkbert, R.L. Yee, G.C., Matze, G.R., Wells, B.G. and Posey, L. Michael, eds.) pp 430-459. McGraw-Hill Medical Pubishing, Division, New York, 1999. Walter MR, Cook WJ, Ealick SE, Nagabhushan, TL, Trotta, PP and Bugg, CE. Three-Dimensional Structure of Recombinant Human Granulocyte-Macrophage Colony-Stimulating Factor, J. Mol. Biol. 224:1075-1085 (1992). 9McFadden, Jr., E. R., Diseases of the Respiratory System: Asthma, In Harrison's Principles of Internal Medicine 14th edition, (Isselbacher, K.J., Braunwald, E., Wilson, J.D., Martin, J.B., Fauci, A.S. and Kasper, D.L., eds) McGraw-Hill, Inc (Health Professions Division), 1998, p 1422.